The Arctic Ocean is governed by the UNCLOS - the United Nations Convention on the Law Of the Sea. The convention came into force in 1994 with the purpose of settling unsolved delimitation issues regarding oceanic territory. UNCLOS is ratified by 161 countries. Among these are the arctic coastal states of Canada, Denmark, Norway and the Russian Federation, however, not the USA. The Commission on the Limits of the Continental Shelf (CLCS) consists of 21 members (elected for the period 2007-12), who all have technical expertise within the scientific areas of geology, geophysics or hydrography. The members are candidates from those countries, who have ratified the UNCLOS. They usually meet twice a year. According to appendix II of the UNCLOS, the role of CLCS is to "consider the data and other material submitted by coastal States..." as well as "to provide scientific and technical advice, if requested by the coastal State concerned during preparation of such data". CLCS makes final and binding recommendations to coastal States on matters regarding the establishment of the outer limits. The commission sets the terms for how data must be gathered and documented in order to submit a legitimate claim to an outer limit of the continental shelf. Coastal states who have ratified the UNCLOS must follow the recommendations of the CLCS, when establishing the outer limits of their continental shelves, which extends beyond 200 nautical miles. Download the report on Scientific and Technical Guidelines of the Commission on the Limits of the Continental Shelf here. The CLCS consists of 20 members of different nationality with relevant scientific background. To see the list of their field of methods, go to the website of CLCS. Of the various articles in the UNCLOS we have chosen to focus on article 76 as it determines the rules for claiming the outer limit of the continental shelf beyond 200 nautical miles. Article 76 in the convention states that "equitable geographical representation" on the matter must be submitted to the Commission on the Limits of the Continental Shelf. The submission must take place no later than 10 years after ratification of the UNCLOS. 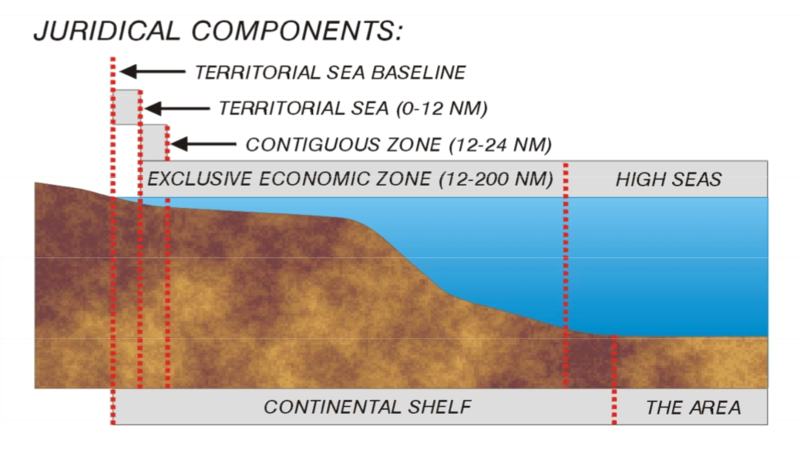 According to article 56, coastal states have "sovereign rights for the purpose of exploring and exploiting, conserving and managing the natural resources, whether living or non-living" on and below the sea bed within 200 nautical miles from the baselines from which the breadth of the territorial sea is measured. Sea bed and ocean floor which lie beyond national jurisdiction can, however, be claimed by coastal states if they are scientifically proven to be natural prolongations of the land mass. In legal terms this yet unclaimed territory is referred to as the "Area".